About: We all know how vital the experience of play is for children and their mental, emotional and physical development. Even the most basic playtime encases a world of wonder and advancement in children on a hollistic level, well into their tweens and even teens. It's sad, then, that as we age, we lose the capacity and desire to play... play that is unhibited and undertaken with purity and joy. 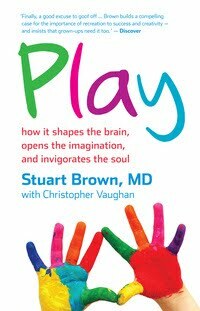 Perhaps this book by Stuart Brown MD, will help us rediscover the wonder and soul-warming benefits of not only encouraging play within our children, but within ourselves. In Play, Dr Brown clearly illustrates that play is anything but trivial and unimportant. He believes play is a biological drive that's as integral to our health as sleep or nutrition. He also believes it's the mechanism by which we become resilient, smart and adaptable - all elements most parents would want to see instilled in their offspring. In fact, Dr Brown believes that our ability to play throughout life is the single most important factor in determining our success and happiness. Brown writes with intelligence, warmth and a relaxed, approachable manner. His illustrative stories on how play influences our lives are a pleasure to read and there are many 'aha' moments that will have you nodding and smiling. The author explains play, what it is and why we do it. He describes what happens with the brain when we play, he intimates how we are totally built for play - and lots of it. We learn how adults play, the different play personalities, and of course - we delve into the greatest game of all - parenthood - in which the author discusses celebratory and ritualistic play, storytelling and narrative play, transformative-integrative and creative play, learning, memory and more. We are also taken through the sophomoric rites of adolescence, how children morph into adults and, most interestingly, the fact that the opposite of play is NOT work. How can we, as adults, incorporate play into our work? How can it help us foster and hone our careers, even in non-creative fields? This fascinating book is not just for parents - it's an insightful look into the essence of Life - how we embrace it and how we enjoy it. Using a blend of neuroscience, biology, psychology, social science and inspiring human stories, Play covers all bases when it comes to reminding us that learning and retaining a sense of play is not only educational, it's arguably one of the greatest investments in happiness and contentment we could ever make. Stuart Brown, MD, is a medical doctor, psychiatrist, clinical researcher and the founder of the National Institute for Play. He speaks regularly to Fortune 500 companies and groups across the US on the importance of play in our lives. The producer of a three-part PBS series, The Promise of Play, he has also appeared on National Public Radio and was featured in a cover story in The New York Times Magazine.